Wow this has to be the find of the year! Get your old bread-maker out of storage and dust if off; this recipe is to die for. A grain and gluten free bread you can make at home knowing every ingredient that has gone into it. Perfect under your eggs or with a slab of quality grass-fed butter! My sister sent me this nearly a year ago, it was a recipe created by a paleo-baker friend of hers, in Christchurch, New Zealand. So it has sat in my email folder all this time. Every now and then I would take it out and think to myself – I must make this! Well today I did and what a sensational loaf it is! It was hardly out of the bread-maker before we had sliced it, slapped on butter and greedily chowed down every last crumb. So thank you, unnamed paleo-baker friend of my sister who lives in Christchurch, this one’s a keeper! Wanting more? How about some cheesy rolls to go with your soup? 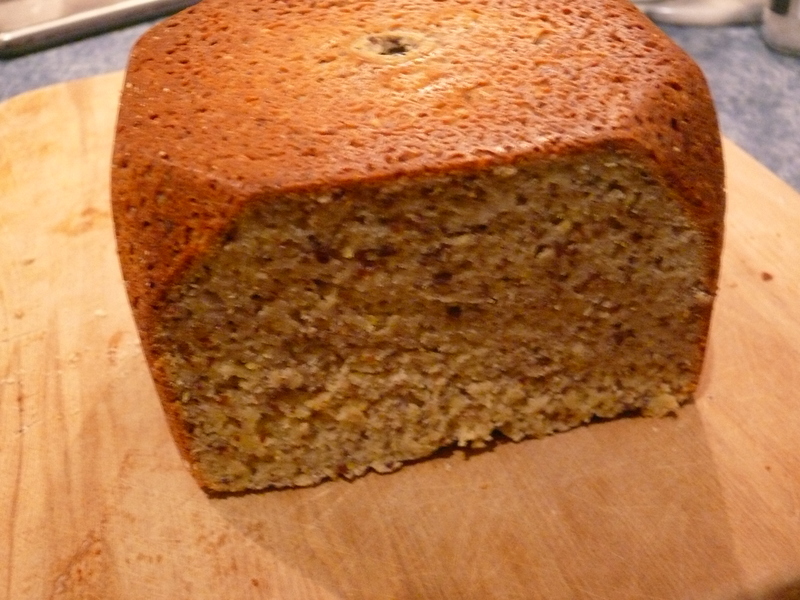 And here is another paleo bread-maker recipe Almond, Chia Seed & Walnut Flour Bread. Don’t want to miss any new paleo bread recipes then hit the Follow me button on your right for free recipes and posts. 1 tsp salt – I used Himalayan. Mix together until blended the first seven ingredients and pour into your Bread-maker pan. Rest for 2 minutes or while you are gathering the other ingredients. Add the mix to the Bread-maker pan. Set your machine to Whole Wheat seating for a smaller loaf and medium colour crust. Once the dough has done it’s first mix, check to see that all ingredients are incorporated, gently mix by hand if not. Remove once cooked, cool and slice. And how about a few sweet loaves? My latest is Banana and Plum loaf, also try Lemon, Honey and Ginger loaf and Banana and Coconut Bread. All are gluten-free and grain-free. Is this for 1.5, 2.0, or 2.5 pound loaf? My bread maker does not have loaves in pounds just a ‘small loaf’ setting so I’m guessing 1.5 pounds? I tried this in my bread maker using Bob’s GF Paleo Baking Flour….it turned out totally gumpy and only the ends were sliceable. Flavor was fine, but a little too much chia seeds. Was very disappointed. The flour was a combination of all the flours listed in the recipe. Don’t know why it did not turn out. Sorry to hear that, sounds like the ratios of the different flours in the store bought Paleo flour were wrong for this recipe. Is there any replacement for psyllium husk, chia seeds or flaxseed? Sorry I have not tried it without. How many calories per slice does this recipe contain? Sorry but I haven’t worked out the calories for the loaf (or slices). Sorry, I have not worked out the calories for this recipe. 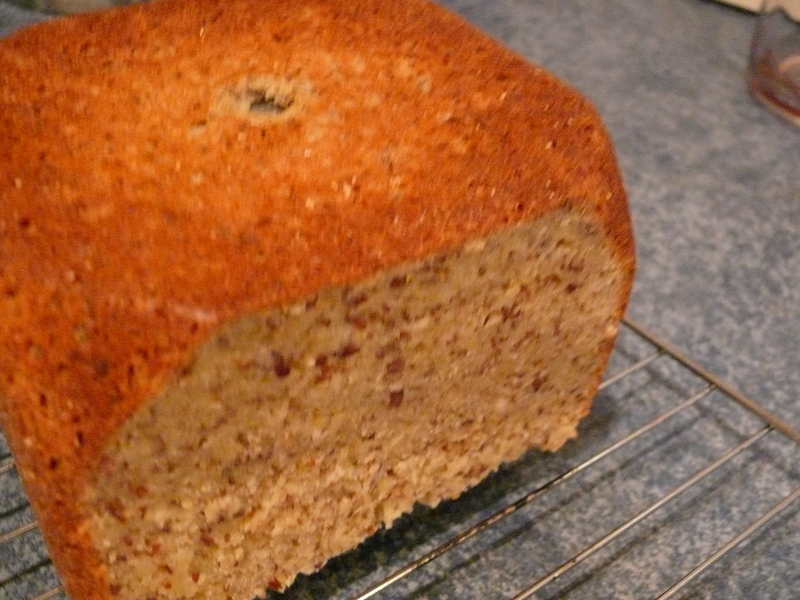 Have you tried this recipe without the flax seed? Or is there something I can sub for the flax? Yes you can. I use ground Chia seeds as I don’t tolerate flax seeds myself. Is it possible to do this with no honey? Do you have to make this in a bread maker? Hi Cathy, I think you could make this without a bread maker, but you would have to follow traditional bread making allowing it to rise. I do have a bread roll recipe that you can make without a bread maker http://wp.me/p4DO8O-uF. Trying this recipe this weekend! Happy St. Patricks Day! Oh yay! I hope you like it as much as I do! That’s a great question! The general notion is that almond meal is from raw almonds with the skin on and almond flour is from blanched or skinless almonds. Does that help? Hi Jo, that’s a interesting question and I hate to disappoint but I am really not sure. You are not comparing like with like as the different flours have different properties. Arrowroot flour adds lightness to a mix and Tapioca flour adds a bit of elasticity. If you look at coconut flour while it has a finer crumb it is full of fibre so needs a lot of wet ingredients. So you really are not subing out like for like. Because this recipe calls for a lot of almond flour (expensive), unless you were willing to experiment then I would not recommend the change. If you are then try just 1/2 cup coconut flour. Good luck! Just had it with creamy scrambled eggs – very yum.